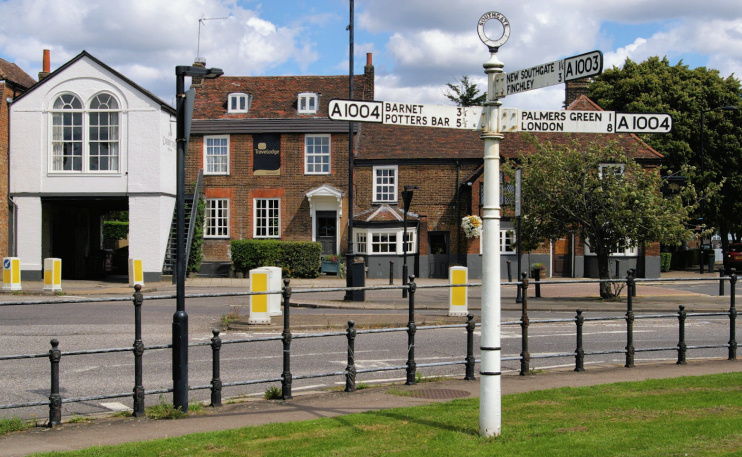 Southgate, the hamlet that grew up by the southern entrance to Enfield Chase, was first mentioned in 1370. The gate stood near what is now Southgate tube station. 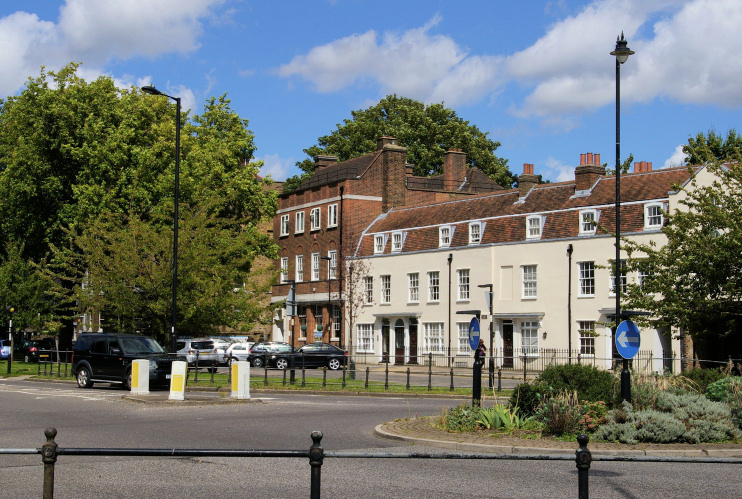 Another settlement grew up along what was then called South Street, in the vicinity of Southgate Green – and this article is about that locality. Apart from the basics of its layout, which was probably estab­lished by the 14th century, nothing survives here from the Middle Ages. The absence of a medieval church or civil admin­is­tration (Southgate village formed part of Edmonton parish and hundred) suggests it was a small settlement. Early maps show no traces of a field system and it is likely that the village’s first inhab­itants were primarily woodsmen rather than farmers. At this time much of the land around Southgate Green was held by the Augustinian nuns of the Priory of St Mary, Clerkenwell, and the Charterhouse estate. During the 16th century the monastic lands surrounding the village centre were divided into several substantial estates, notably Arnolds (later known as Arno’s or Arnos Grove) and Minchenden. John Weld built the village’s first chapel in 1615, by which time he owned both those estates. A Cherry Tree Inn has stood to the east of the Green since at least 1624. Shown in the photo below, the Cherry Tree’s present group of buildings is of very mixed antiquity, beginning c.1695. Attracted by the scenery and tranquillity of the area, wealthy Londoners began to settle in Southgate during the 18th century, clearing the scenic, tranquil woods to build mansions set in landscaped parkland surrounded by farms. Meanwhile, the area around the Green and the south end of the High Street was trans­formed by the erection of a fine group of substantial Georgian houses intended for the well-to-do. By the end of the 18th century the village had grown to occupy most of the High Street, with a more dispersed pattern of settlement around the Green and Cannon Hill. This was the consequence of individual activity by several landowners with relat­ively small holdings, each devel­oping their own plots as they saw fit. Houses from this era include the terrace shown on the right of the photo at the top of this article, which was probably designed by Michael Searles, who did some partic­u­larly fine work in Blackheath and Walworth. In the Victorian era Southgate was not subject to the same intensive suburban devel­opment as much of the surrounding area, and maintained its reputation as an unspoilt rural idyll. This was principally due a private green belt policy operated by the dominant landowning family at that time, the Walker brothers. They laid out the Walker cricket ground between 1853 and 1867, and provided 13 acres of land for a cemetery. The Walkers’ control resulted in a lack of available land for building. The village’s consequent insig­ni­ficance meant that it was bypassed by the suburban railway network, which further limited its growth. Southgate became a parish in 1845 and the Weld chapel was replaced in 1862 with Christ Church, which was designed by George Gilbert Scott in Early English style. 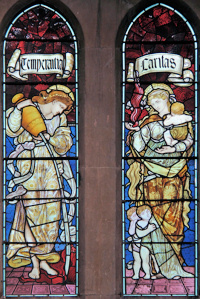 The church has some of the best stained glass in London – arguably the best if your tastes lean towards the pre-Raphaelite – including a William Morris self-portrait (in the guise of St Matthew). Later in the 19th century the relationship between Southgate and Edmonton became increas­ingly frosty as the generally rich community of Southgate grew resentful at having to subsidise services mainly used by the poorer residents of Edmonton. Matters came to a head in 1881 when Southgate formed a separate admin­is­trative area, with its own local board of health, based at Ash Lodge. In the early 20th century specu­lative developers at last gained a foothold in Southgate and the area to the north of Southgate Green was trans­formed from a rural backwater to a suburban centre – a process that accel­erated after 1918, when the last of the Walker brothers sold the Arnos Grove estate. Adjoining the churchyard on Waterfall Road, Minchenden Oak Garden was created in 1934 as an evergreen garden of remem­brance. Its eponymous tree is thought to be a survivor of the ancient Forest of Middlesex and it later adorned the grounds of Minchenden House (a mansion demol­ished by the Walkers in the 1850s). Relatively little change has taken place in the vicinity of Old Southgate since the Second World War other than the construction of three compact blocks of council flats and two primary schools: Walker and St Monica’s. The Cherry Tree is now owned by Mitchells & Butlers and operates within their Vintage Inns portfolio. Part of its group of buildings is now a Travelodge. At the 2011 census, 41 per cent of the residents of the Southgate Green ward were white British. The next largest minority (20 per cent) was of Indian birth or descent. * The pictures of Southgate Green and Ye Olde Cherry Tree are adapted from original photographs, copyright Christopher Hilton, and the picture of the Christ Church stained glass is slightly modified from an original photograph, copyright John Salmon, all at Geograph Britain and Ireland, made available under the Attribution-ShareAlike 2.0 Generic Licence. Any subsequent reuse is freely permitted under the terms of that licence.